Tesla says production, deliveries and profits should all improve in 2015, aided by the third-quarter launch of the Model X and ongoing deliveries of the Model S, pictured. PALO ALTO, Calif. -- Tesla Motors Inc.'s fourth-quarter net losses widened to $108 million from $16 million as the electric-vehicle manufacturer approached the final stages of development for its Model X crossover. Fourth-quarter revenues were $957 million, up 55 percent from $615 million in the last quarter of 2013. Revenue using Tesla's preferred non-GAAP accounting method rose 44 percent to $1.1 billion. Tesla said it manufactured 11,627 vehicles in the fourth quarter, meeting its goal of 35,000 vehicles for the 2014 calendar year. But many of them were not delivered to customers by the end of the year, causing Tesla to miss its original target for deliveries. Tesla lowered its delivery goal from 35,000 to 33,000 vehicles in November due to manufacturing snags with the launch of an all-wheel drive version of its Model S sedan. "While we were able to recover the lost production by end of the quarter, delivering those cars was physically impossible due to a combination of customers being on vacation, severe winter weather and shipping problems," the automaker said in a letter to shareholders Wednesday. Tesla said production, deliveries and profits should all improve in 2015, aided by the third-quarter launch of the Model X. The company plans to deliver 55,000 vehicles in 2015, a 70 percent increase over 2014 and 5,000 more vehicles than Tesla's previous goal. The company entered the year with 10,000 orders for the Model S and 20,000 orders for the Model X. Speaking to analysts later on Wednesday, Musk said the Model X will not be shown in public "until it gets delivered." He said Tesla will avoid going "super crazy" with a subsequent model, the mass-market Model 3, to prevent the sort of delays that have affected the Model X. "It will be an amazing car, but it won't be the most adventurous version of the Model 3 to begin with," Musk said. "We'll have ... more of the Model 3 on the Model 3 platform following the initial version." Tesla, which exports its Model S sedan to Europe and Asia from its assembly plant in Fremont, Calif., also warned that a strengthening dollar will eat into earnings. Gross profit margin for the first quarter of 2015 will be 26 percent rather than 28 percent if exchange rates remain at current levels, the company said. 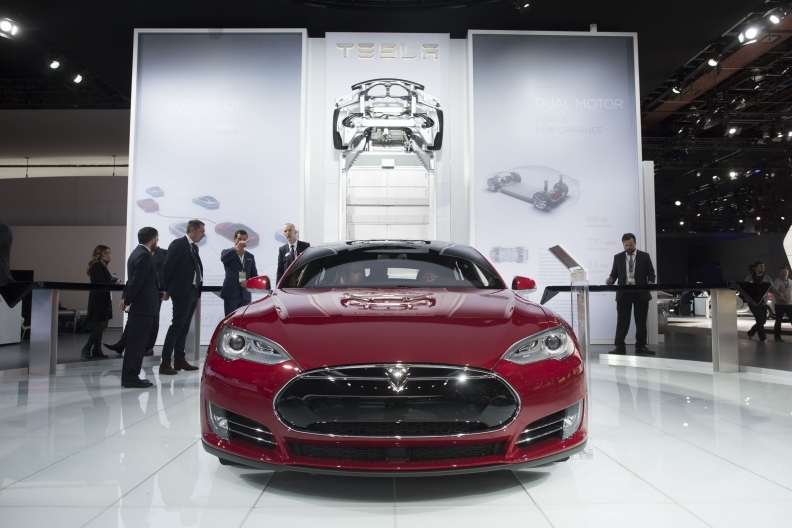 For all of 2014, Tesla's net loss widened to $294 million from $74 million in 2013. Revenue soared 59 percent to $3.2 billion. Tesla said it has built 30 beta prototypes of the Model X for testing, and plans to start producing a small fleet of "Release Candidate" vehicles in March "that will be very close to the final production-intent design." Early crash testing has "given us confidence that Model X will live up to the very high safety standard set by Model S," Tesla said. Tesla said it has started installing casting and machining tools at a factory in Lathrop, Calif., to make aluminum components for the Model S and Model X. Tesla leased the factory, a former parts distribution center for Chrysler's Mopar unit, last April.